More news about Harry's hand-made 3-wheeler. 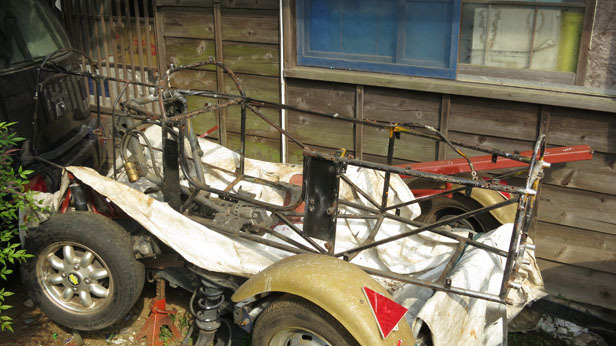 Things are moving on – albeit at a glacial pace – with the 3-wheeler project. It will be registered as a motorcycle and sidecar, which legally limits the overall size to 2.5 metres long and 1.3 metres wide. There is no height restriction. The 250cc engine and transmission will be from a Suzuki Skywave big scooter (Burgman outside Japan). 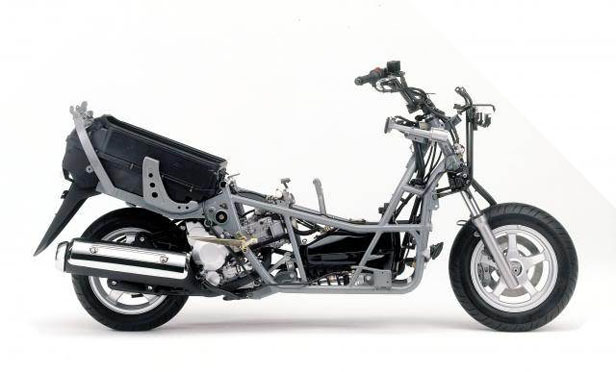 Mr. Haruyama has cut away the rear of the Skywave frame, including the swing-arm and suspension mounts, to use as the central subframe of the 3-wheeler. 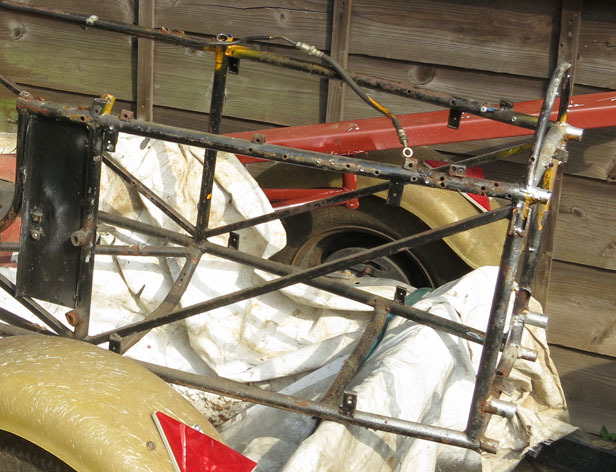 Recently he has torn down his original 3-wheeler to rebuild it again for himself and in the next photo you can see the subframe in situ. 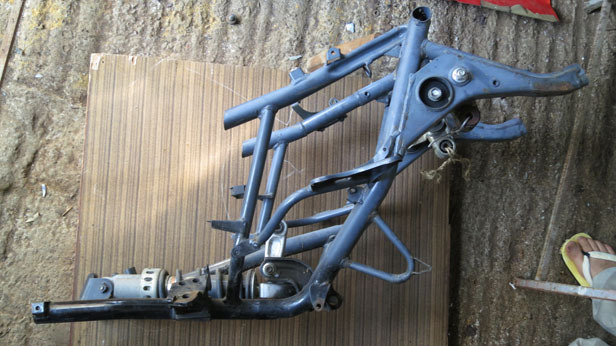 He has taken the opportunity to cut off even more of the original frame than the subframe for my vehicle, to save some weight. 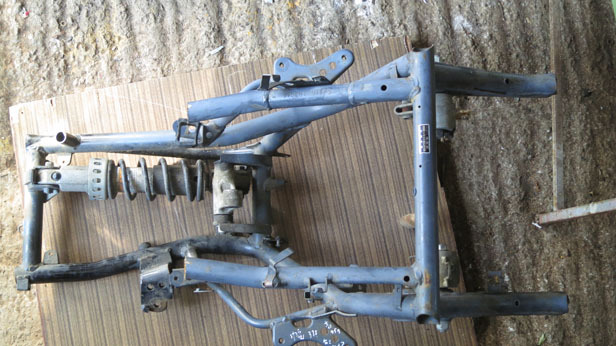 The tubes of the frame of the original 3-wheeler are peppered with holes for mounting body panels, which must reduce the strength a lot. I will be asking him to use welded brackets to do the same job wherever possible. 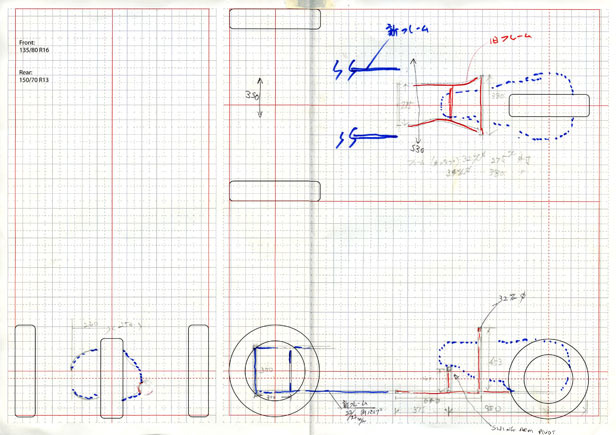 I made a rough schematic of the wheel layout and asked Mr. Haruyama to draw the rest of the layout over it. This is what he gave me. Um… pretty rough, as you can see. 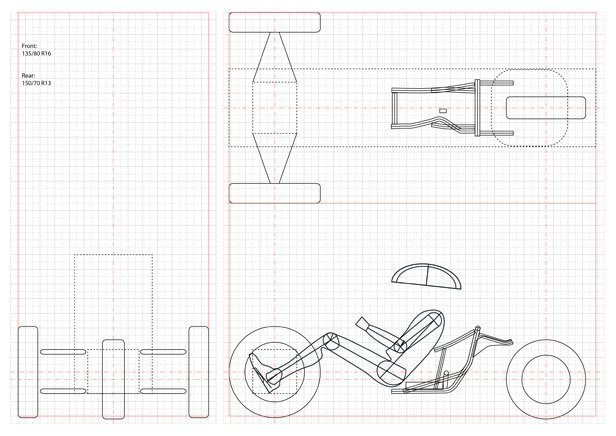 Based on these dimensions, measurements of the Skywave frame and photos of the frame and original 3-wheeler I added more details, including a mannequin roughly the same size as me. The original Haruyama 3-wheeler has front strut suspension, using the axles as lower links and located fore/aft by radius arms. He wants to try wishbone suspension on the new one. So, now this goes open source inside Envision. Let’s see what the designers come up with… and how they match the Haruyama aesthetic. 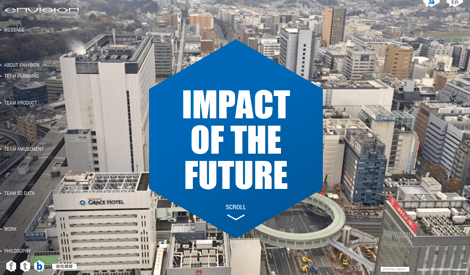 Any contributions from outside Envision welcome – and credited if they are used! Contact me at info@e-v.jp if you would like to receive bigger JPEGS of the package.